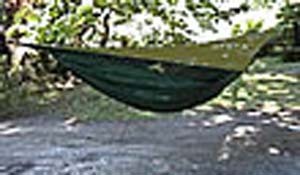 This breakthrough hammock/tent/chair/lounger combo is the latest in lightweight, compact, inexpensive shelter. Assymmetrical shape provides instant comfort over rocky, wet or sloping terrain and protection from sun, wind, rain, black flies, etc. Features include a patented self-closing entrance through the bottom, which seals automatically and a new comfortable shape to keep your back straight and level when resting on the diagonal. Forest Green with Forest Green and Black Trim. Includes Tree Hugger straps to prevent damage to tree bark. Expedition weighs 2.5 lbs., Weight limit: 250 lbs., Packaged size: 6"x 12".